Few publications have celebrated the prodigious talents of Southwest Virginia writers and artists as Artemis. For the better part of four decades, the literary journal, published annually, has showcased compelling new voices in tandem with notable authors that have ranged from poet laureates to Pulitzer Prize and other major award winners and nominees. The rich history of creativity at Hollins University in the written word and other artistic expression has played an integral role in the success and perseverance of Artemis: Through the years, over 140 Hollins writers and artists, including more than 90 students and 40 professors, have been featured contributors, or have donated their time and expertise as board members for the all-volunteer operation. “Without Hollins and the direction it provided, Artemis would not have lasted,” says editor and founder Jeri Rogers, who herself is a Hollins alumna, having earned her Master of Arts in Liberal Studies in 1991. The literary journal Artemis was first published in 1977. A sculpture by Betty Branch ’79, M.A.L.S. ’87 graced the cover of Artemis‘ 2016 issue. The first 20-plus years of the journal’s existence were gratifying yet exhausting for Rogers and her volunteers. During the same time period she was raising three children and working as a professional photographer. Artemis went dormant in 2000 for more than ten years, but its concept and mission never diminished. 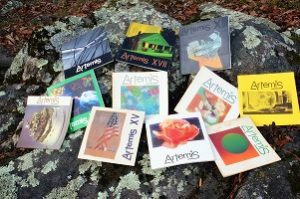 “There were a number of us who missed it,” Rogers recalls, “and we decided to resurrect it in 2014” with one caveat: “We’ve gotta keep it small.” Today, the Artemis staff features Rogers and just six other volunteers, and she’s emphasized recruiting younger people to ensure the journal continues for years to come. Since its return, Artemis has actually seen its print number increase to somewhere between 500 and 600 copies. Most copies are sold for $25 each during a celebration launch event held each year at Roanoke’s Taubman Museum of Art. The official debut of Artemis XXVI, the 2019 edition of the journal, takes place on Friday, June 7, and will feature a special dance performance by the Southwest Virginia Ballet. 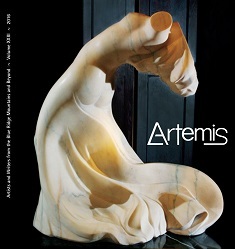 Artemis is also made available for purchase online – the journal is planning a pre-sale event for the 2019 edition this spring where the book will be available for $20 – and Rogers says sales have “gone beyond the Blue Ridge Mountains,” reflecting the fact that submissions have been coming in from writers and artists outside the region. 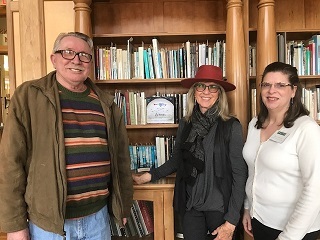 (l. to r.): Artemis literary editor Maurice Ferguson, Artemis editor and founder Jeri Rogers, and Special Collections Librarian Beth Harris of Hollins’ Wyndham Robertson Library. Fittingly, the two featured writers and artists in Artemis XXVI are distinguished Hollins alumnae: Natasha Trethewey M.A. ‘91, Pulitzer Prize winner and former U.S. Poet Laureate, and Sally Mann ’74, M.A. ’75, who was named “America’s Best Photographer” by Time magazine. While Rogers acknowledges that she’s “not going to be around forever” as editor of Artemis, she clearly relishes the achievement each edition represents and considers last year’s issue to be her proudest moment. At the same time, she is quick to praise the many volunteers that have supported the journal over the years, noting that “it literally takes a village to sustain the energy needed for Artemis.” Two of the key players along with Rogers since the beginning who continue to play vital roles today are literary editor Maurice Ferguson and design editor Virginia Lepley. Rogers also cites organizations such as the Taubman, which provides space for the annual issue launch free of charge, and the Roanoke Arts Commission, whose grants have given Artemis crucial financial support. 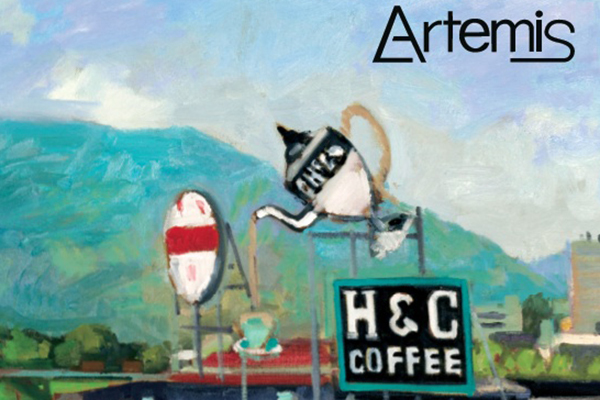 Top Image: The artwork for the cover of Artemis‘ 2015 issue, created by Hollins Professor of Art Emeritus Bill White.